Welcome to Delhi: - Royal Rajasthan tour will start with your arrival at Delhi the capital of kingdoms and empires is now a sprawling metropolis with a fascinating blend of the past and the present. It is a perfect introduction to the composite culture of an ancient land. A window to the kaleidoscope - that is India. Get grand reception at airport arrival by Trojan Holidays representative. Later, get transfer to the hotel. Spend the day at leisure and enjoying shopping. Come back to hotel for an overnight stay. After healthy breakfast in the morning check out from the hotel and drive to airport to board your flight to Srinagar, Arrive Srinagar, meet assist at the airport and transfer to Deluxe Houseboat. Afternoon at leisure. 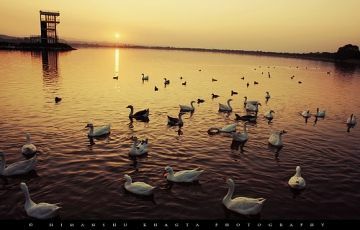 In the evening Shikara ride on Dal Lake to enjoy the sunset. Night stay at Houseboat. Day 03: Local Sightseeing - Srinagar - 50Kms. 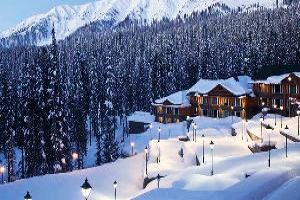 After healthy breakfast in the morning check out from the hotel and proceed to Gulmarg reach there and check in at the hotel, afternoon full day tour of Gulmarg which is one of the most beautiful summer resort in the valley. It is also popular for its golf course (in summer), the highest in the world and skiing during the winter season. 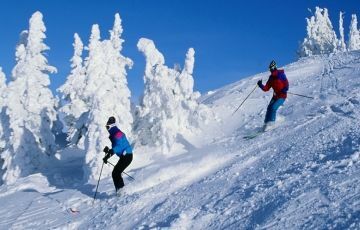 Enjoy the splendor of nature and the snowy mountains. One can have Gondola ride (cable car) from Gulmarg to Khalinmarg. In the evening come back to the hotel, Night stay at Hotel. 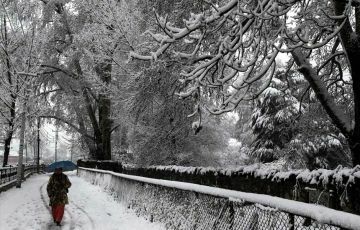 After breakfast leave Pahalgam and drive to Srinagar, and transfer to airport to board your flight to Delhi. Reach Delhi and check in at the hotel, evening free for own leisure activities. Overnight at the hotel. 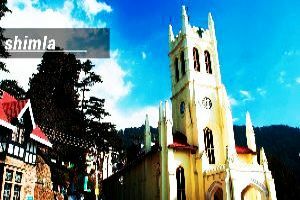 Shimla: former summer capital of British India & now a capital of Himachal Pradesh, set amidst the snow capped shivalik mountain ranges offering some stunning views of the mighty Himalayas, it is surrounded by pine deodar, oak and rhododendron forests. Towards the north lie the snow-covered high-ranges, while the valleys breathe whispering streams and swaying fields. 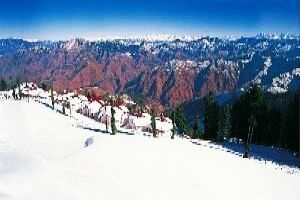 Shimla offers a variety of shopping, sport and entertainment activities. Arrive Shimla Check in to the Hotel. Rest of the day is at leisure, evening enjoy at mall road. Later back to hotel. Overnight stay at hotel in Shimla. After breakfast visit to half day city tour visiting Indian Institute Of Advanced Studies, Sankat Mochan Temple and Jakhu temple, Afternoon visit to excursion tour of Kufri & Chail, Kufri: a popular ski resort in winters, which offers some stunning mountain views, Later drive to Chail: The Chail Palace is well known for its architecture. The cricket ground and a polo ground which is there at an altitude of 2,444 m was owned by erstwhile royal family of Patiala. It is the world's highest cricket ground. In 1891, Maharaja Bhupinder Singh of Patiala incurred the rage of Lord Kitchener. It led to the restriction of his entry into the summer capital, Shimla. This incensed the Maharaja and he vowed to build a new summer capital for himself. So he rebuilt the place (Chail) as per his requirements. There we will visit the Palace of former Maharaja of Patiyala. Later back to hotel. Overnight stay at hotel at Shimla. 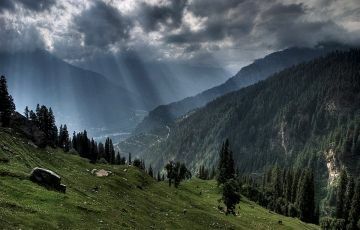 Manali: at the northern end of the Kullu Valley in Himachal Pradesh, is a hill station situated at a height of 2050 m (6398 ft) in the Himalayas. 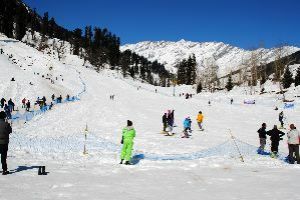 Situated on the Beas river (Vyaas in Hindi) and near its source, it is a popular tourist spot for Indians in summer and a magical, snow-covered place in winter. A staging point for a number of treks (Beas Kund, Chandrakhani Pass) and sports such as white-water rafting, Manali is also on the road to Ladakh via the valley of Lahaul and Spiti and rohtang pass which is main attraction near Manali. Arrive at Manali and check in the hotel, Rest of the day is at leisure to visit the local markets overnight stay at hotel at Manali. After early breakfast visit to excursion visiting Kothi Gorge, Gulaba, Marhi, Rohtang Pass (Upto Snow Line in case Rohtang is closed due to snow fall) Carry warm clothes like hand gloves, muffler, sweater, shawl, socks & sports shoes etc. Enroute overcoats and shoes are available on hire. Please note that Rohtang Pass (altitude 3940 mts.) is actually 51 kms. far from Manali, due to heavy snow covering the road, this pass is not accessible during heavy snow fall for Snow Point, and Solang Valley. After breakfast visit to city tour. Visiting Hadimba temple, the 450 years old Hadimba Devi Temple, the oldest temple in Manali, Vashisht Temple, Manu temple and picturesque Naggar Valley. Later proceed to Chandigarh: Picturesquely located at the foothills of Shivaliks, the Union territory of Chandigarh serves as the capital of Punjab and Haryana. 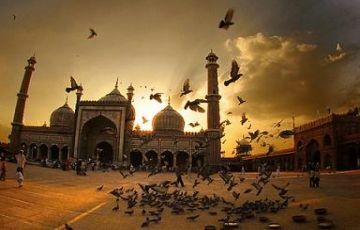 The city derives its name from the temple of ""Chandi Mandir"" located in the vicinity of the site selected for the city. The deity 'Chandi', the goddess of power and a fort 'garh' beyond the temple gave the city its name ""Chandigarh-The City Beautiful"".Known internationally for its architecture and urban planning, in the afternoon Visit Rock Garden, Rose Garden And Sukhna Lake also visit to Pinjore Garden, also visit Zakir rose garden, in the afternoon check out from the hotel and drive back to Delhi, overnight at the hotel. After breakfast check out from hotel, proceed for Delhi. Welcome at Delhi: - On arrival at the capital city of India get welcome by the Trojan Holiday’s representative and later get transferred to hotel. 5. Rickshaw ride in Delhi. 6. 01 mineral water bottle per person per day. 7. Surface Travel by exclusive air-conditioned car Air-conditioned will not work in hilly areas. 8. All transfers & sightseeing as per the itinerary. 9. All taxes, driver allowances, Parking etc. 5. Any item not shown in Cost Includes.